PeriFresh™ contains aloe vera, which helps to moisturize sensitive skin areas and has a fresh-fruit fragrance that neutralizes odors on contact and leaves the patient feeling clean and refreshed. 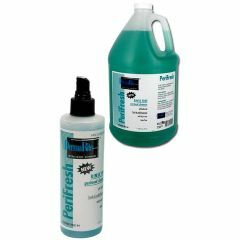 The non-irritating formula gently emulsifies and cleans dried urine and feces quickly. PH Balanced. Rinse Free. fresh but not perfumey.. gentle for dry skin. removes urine odors. storing gallon,refilling . smaller spray bottles. otherwise no cons. incontinence,peri care. between baths, freshen up. caregiver . for 80 yr old mom in law. former hospital cna. This peri wash is so good for the price. soaps up well,pat it dry. simply cleans, smells good. I like the stay briefs and wet wipes, and this wash. All are great bargain priced items and great quality for home care disposables. We also use the reliamed reusable bed pads with tuck in flaps. Again...great bargain item. They are used as draw sheets for lifting, positioning and bed protection from incontinence, super sudsy baths and hair washing in bed. Excellent smell . does the job for cleanups. I use this product on my elderly mother, she loves the smell of it and it refreshers her after changes. cleaning incontinence patients. cleaning for incontinence. caregiver of dementia parent. caregiver . It's great for incontinent patients. Makes cleanup easier. It cleans my daughter wel. It cleans my daughter wel. cleans my daughter well. For sponge bathing her wh. I am her Mom and care pro. Good to mix with water in the basin when sponge bathing my daughter.